Protein and carbohydrate mix. Improves muscle recovery and growth. Sustained Release Protein. It provides 22g of protein per serving. With calcium. Smart sequential anabolic formula. It improves the recovery processes with added l-glutamine. Combination of slow and fast assimilation proteins. 200g FREE! The most anabolic protein in the market. 5 types of proteins, PepForm, BCAA´s, Glutamine, PhosphoMatrix, Leucine and Tryptophan. Ultrafiltered Whey Protein. Great BCAA supply per serving. Time release proteins. It provides 25g of protein and 5.8g of BCAA's. Protein shake, sugar-free. Enriched with hydrolysed collagen and fibre (inulin). I recover better from physical exercise since I started using it and I wake up feeling less hungry, which is great because I like doing some cardio on an empty stomach before eating my breakfast. The chocolate-caramel flavour is my favourite so far! A great protein blend. The snickerdoodle flavour and the texture are excellent. I use it at night before going to sleep but also in the morning if I am going to spend several hours without eating anything. What´s good about Pharma Blend is it´s an all round protein blend, you can take it post workout, as a meal replacement, at night before sleeping or just to boost your protein intake. What are Time Released Proteins? When to consume Time Released Proteins? Time Released Proteins are supplements that are made of several protein sources and each one has a different absorption rate. Proteins are made of amino acid chains, with links between them. It is through the digestion process that proteins are finally reduced to their basic unitary elements in order to be absorbed. The amount of time between the consumption and the absorption of the protein will vary depending on the protein source. This feature sets the behaviour of the protein at a molecular level and its subsequent absorption. Hydrolyzed protein has the highest absorption rate because it has large amounts of peptides in its composition. This term refers to the way in which our bodies absorb proteins. This process takes place in the intestines and the peptides will be the molecules that are absorbed. In this regard, hydrolyzed protein already has this basic sequence as part of its composition, which allows the maximum degree of absorption. Even though it would be ideal to be able to consume this type of protein exclusively, the reality is that our system has a limit, and it can become saturated. That is why it is important to include other protein sources with a slower absorption rate in order to obtain the same benefits, but without saturating the receptors. Increasing the amino acids concentration in blood plasma will produce a strong response for the protein synthesis, and dropping afterwards. It is precisely from this point onward that we can benefit from time released proteins. If we provide different proteins with different absorption rates, we will be able to obtain a number of peaks for the protein synthesis, apart from maintaining a constant amino acids flow in our bloodstream, prolonging the duration and increasing the impact of the hormonal response that is useful for muscle growth. Among the different types of sustained release protein, there are a combination of two or mores sources. However, we may occasionally purchase proteins that have other ingredients in order to reinforce the formula for some specific purpose, such as losing or gaining weight. 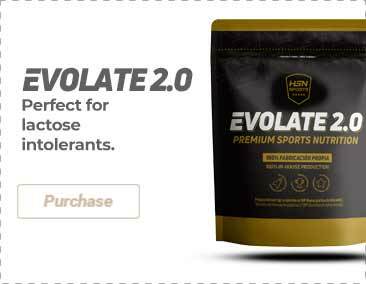 Evomatrix: a blend of protein isolate and concentrate with glutamine peptides. Evodiet: it has protein isolate and concentrate with vitamins B3, B6, acetyl L-carnitine, flaxseed oil, and green tea. Evomeal: it acts as a food substitute due to its especial composition. Evonight: it has up to 7 different protein types, ideal to use before going to sleep.